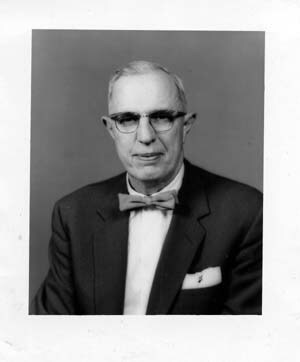 My Grandfather, Carl Worrick, obtained the call W8FGU in 1932 and held it until his passing in October of 1975. This was his retirement picture from the Detroit Edison Co., here in Trenton, MI, where he retired as a shift supervisor. He got me started in Ham Radio as a youngster in the late 1960's and early 1970's. He was my mentor and elmer (before I even new what an elmer was). Many hours were spent in his basement shack where we would learn Morse Code, build crystal radio and code oscillator kits, or just study basic electronics. He was a self taught, motivated amateur radio technician. He was very much a wiz with tubes and tube circuits, but admitted that the "new solid state stuff" was something he would have to work on before getting a good understanding of their workings. We had other parallels in our lives as well. He started out as a firefighter for the City of River Rouge, MI in the 1920's and then left to begin his career at Detroit Edison Co.'s, Trenton Channel Plant, honing his electronic skills. I also heard he was an accomplished piano player (although i never heard him play ). I, on the other hand, began my career as and electronic tech, then a 16 year career in the computer IT field and then a complete 180 degree turn to the fire service as a line officer, firefighter/paramedic. All the while, I started out as an alto sax player in jazz bands and wound up as a hard rock drummer in the 80's - still today. I would hope he would appreciate the similarities. My Grandfather held the call W8FGU for over 40 years. It took a break for about 30 years, and now I am very proud to have it back on the air again. I just hope to honor him, his call, and operate as well as he did.